Elliot M. Ser, D.B.A. 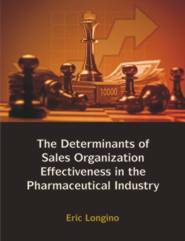 ; Craig Barton, Ph.D.; Herbert M. Turner, III, Ph.D.
Limited research exists about the determinants of sales organization effectiveness in pharmaceutical sales organizations. To fill this void, sales management control, sales territory design, and sales force performance are conceptualized as antecedents to sales organization effectiveness in pharmaceutical sales organizations. The results of the structural equation model tested suggested that pharmaceutical sales representatives perform better and are more effective when they are satisfied with sales territory design because of its significant relationship with sales force behavioral performance. The present study suggests sales force behavioral performance leads to sales organization effectiveness through its significant relationship to sales force outcome performance. These findings are somewhat different to those from similar studies in other industries, and identify some important implications for sales leaders in the pharmaceutical industry as well as suggesting a number of important research directions.